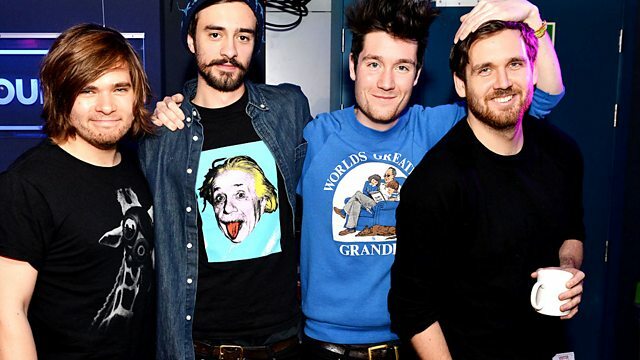 Janice Forsyth talks to chart-topping band Bastille and writer Jackie Kay. Dan and Woody from chart-topping rock band Bastille are in the studio ahead of their sold-out gig in Edinburgh tonight. Writer Jackie Kay will be here to tell us about bringing Maw Broon to the stage as part of this month's Glasgay! festivities, the annual celebration of LGBT culture. A Fife mining community battling with issues of loyalty, honour and trust in the middle of the 1926 General Strike. That's at the heart of a Scottish film with resonances for today. THE HAPPY LANDS, made by Edinburgh's Theatre Workshop, is just out on DVD - director Robert Rae will be here. A football club is not the most obvious place to find music lessons but we'll be hearing about the 14 major clubs across Scotland where over a hundred youngsters are learning how to play. And we meet two of the dynamic sound artists taking over Glasgow this week as it hosts Sonica 2013 - a programme of events and installations dedicated to the sonic arts. Whispers: an installation from Sonica 2013 featuring the sound sculpture of ceramic trumpets by Rob van Rijswijk and Jeroen Strijbos with visual artist Pierluigi Pompei. Watch a video clip of Whispers here. Dan and Woody from the band Bastille drop into the Culture Studio ahead of their sell out Edinburgh gig. We're on Facebook - Why not come along and visit?